When I first moved to San Francisco and discovered the Ferry Plaza Farmer's Market on Saturday mornings I was, like most others, drawn in by the amazing fruits and vegetables on display. Once this abundance of produce became "normal" to me, I finally started paying attention to the other merchants. While most of the prepared foods still never jumped out, the bakeries of course did. This girl cannot resist her baked goods. The one with the longest lines is always Downtown Bakery. Their full bakery and cafe is located in Healdsburg, and has been around since 1987. Their products always look great, but the lines deterred me for quite a while. One day I discovered that they make "donut muffins" and I finally had to break down and try it. I tried a few other items too, including a mini pecan pie for Thanksgiving a few years ago, but sadly, I never really liked anything I tried, and stopped after a few items. The lines are much shorter these days, but I barely give them a second glance as I stroll past, generally making a beeline for the tastiest stone fruits, persimmons, or other seasonally appropriate item of the day. Pecan pie is a classic for me. My mom always makes the classic Karo syrup version, and I love it (although yes, Flour & Co makes a brown sugar nut pie that puts all other nut pies to shame, my mom's included, sorry mom!). So when Thanksgiving rolled around, I knew I needed a pecan pie. And a pumpkin pie (more on that later). But I was planning to cook the entire meal myself for Ojan and I. I decided to not take a risk with making pies (plus I thought that the two of us shouldn't really have a full pumpkin and full pecan pie to eat just ourselves ... ), so I decided to leave it up to the experts. They held a special farmer's market on Wed before Thanksgiving, and I was happy to see Downtown Bakery present, with a bunch of pies, and even better, mini pies. This way, I could have both my pumpkin and pecan pies, and not have a ridiculous amount of leftovers! But it really was not good. There was no sweetness in the filling. No flavor in the filling. It was just there, and there was very little of the expected gooey sweet layer. 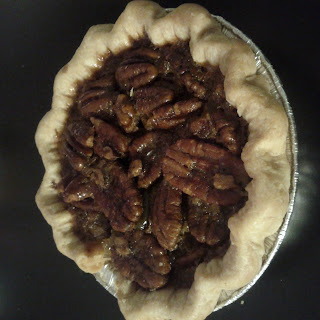 It was however loaded with pecans, as it was 3 layers deep of pecans. The pecans were all left whole, so it was a bit hard to eat. They were also toasted and a little burnt even. It was the inverse problems of the awful pecan pie we had at The Flying Goose. The crust was also flavorless. Disappointing, but also s actually pretty gross, and we didn't bother finish it. English Muffins ($1.75) : Big huge fluffy muffins, but we got a pack for use with egg and cheese breakfast sandwiches, and they were just too much. Very thick and overpowering. Not their fault exactly, and they were nice just toasted with jam. Somewhere closer to a crumpet than what we think of as english muffin. Donut Muffin ($1.75): Probably their most famous item. Donut dough baked not fried, covered in cinnamon sugar. Looks like a muffin. It tasted exactly as you'd expect ... there is a reason donuts are normally fried. While famous, this was nothing special. Chocolate Chip and Macadamia Cookie ($1): Thin, crunchy, totally generic, no reason to ever eat.